Synopsis: Dom Cobb (Leonardo DiCaprio) is a skilled thief, the absolute best in the dangerous art of extraction, stealing valuable secrets from deep within the subconscious, during the dream state when the mind is at its most vulnerable. Cobb's rare ability has made him a coveted player in this treacherous new world of corporate espionage, but it has also made him an international fugitive and cost him everything he has ever loved. In Christopher Nolan's Inception (2010) we have Dom Cobb (Leonardo DiCaprio, Django Unchained) and Arthur (Joseph Gordon-Levitt, Looper) as dream-spies, hi-tech thieves who enter a person's subconscious through their dream, creating multi-layered dream worlds through which they steal trade secretes and information, a form of dream-espionage. At the start of the film they are tasked by Japanese billionaire Mr. Saito (Ken Watanabe, Godzilla)to not steal something but to do something never before achieved, to plant an organic thought/idea into a dreamer's head without them realizing it has been implanted. The target is Saito's dying business rival's son, his sole heir Robert Michael Fischer (Cillian Murphy, 28 Days Later), hoping to plant the idea that he should break-up his father's vast business empire after his father's death. If Cobb succeeds Mr. Saito is offering to use his vast influence to make a murder charge against Cobb disappear, allowing him to re-enter the U.S. and see his two young children. Agreeing to take on the challenge Cobb assembles a dream-team to assist him and Arthur for this highly-complex reverse-heist. The team includes a con man Eames (Tom Hardy, Bronson), a chemist Yusuf (Dileep Rao, Drag Me To Hell), and architect Ariadne (Ellen Page, Juno). The decide the best opportunity for a shared dream with Fisher is during a ten-hour flight as the son accompanies his late father's body home after his death, and the plan is set in motion. The reality-bending excursion is fraught with in-dream dangers, including the possibility of falling into a subconscious limbo-Hell if you die in the dream, which could threaten your sanity, and Cobb's subconscious manifestation of his late wife Mal (Marion Cotillard, A Very Long Engagement) who the threatens to derail the whole deal with her violent actions fueled by Cobb's deep-guilt over her death, which is at the heart of the story. Nolan crafts a great series of dream-heists, ending up being a spy thriller along the lines of a 007 film by way of the reality-bending film along the lines of The Matrix, rooted in a labyrinth of intrigue and visual wonder - this is one of his Noaln's sprawling and action-packed films, a dizzying array of multi-layered dreams, including brilliant car chases and a 007-worthy snow covered mountaintop assault, a stunning zero gravity fight in a hotel hallway/room, as well as exploring Cobb's heart-rendering loss of his wife, it's all so good, there's never a dull moment and it holds up to repeat viewings. The cast of phenomenal, there's not a bad apple in the bunch, most of the cast was either in the first two of Nolan's Dark Knight trilogy or would go onto appear in the third, the exceptions being DiCaprio, who is charismatic as ever, Dileep Rao as the chemist, and Ellen Page, who does good work as the dream-architect recruited by Cobb to create the dream-worlds, she sort of our "in", we learn as she does about how the whole thing works. 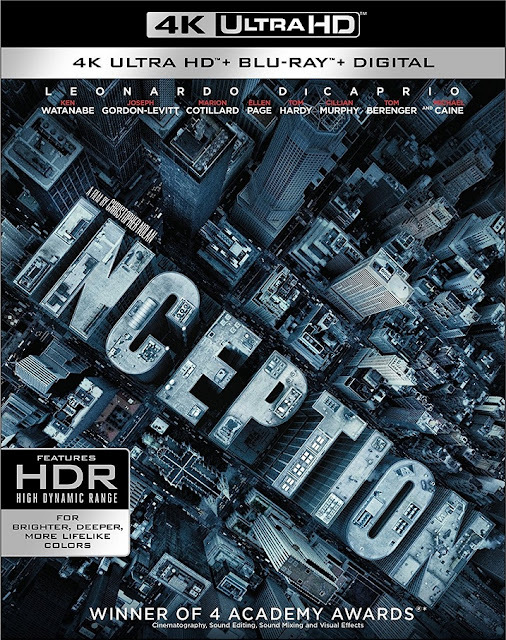 Audio/Video: Inception arrives on 4K UHD from Warner Bros. in 2160p HD framed in 2.40:1 widescreen. The image looks crisp and finely detailed, the close-ups offer pore-defining sharpness. The 4K presentation does show some minor softness in it's presentation compared to other 4K titles I've watched, including both The Dark Knight and The Dark Knight Rises, but I was still suitably impressed, offering a nice upgrade from he Blu-ray but not quite as stunning as other 4K titles I've screened. Audio comes by way of the same DTS-HD MA Surround 5.1 audio track that accompanied the Blu-ray, because Nolan chooses not to go the Dolby Atmos route for any of his titles, but the track is powerful and offers many surround delights throughout, the deep, bass-driven score from Hans Zimmer is an immersive stunner, optional English subtitles are provided. Onto the extras we have the picture-in-picture Extraction Mode on the Blu-ray disc accompanying the feature, the other extras are relegated to their own Blu-ray disc. Inception (2010) gets a very nice 4K upgrade from WB, revisiting it in ultra-HD was a wonderful viewing experience, it certainly holds up as one of Nolan's most ambitious and mind-bending films to date, and that's saying something.